Fish from anywhere..NO boat required to use this Fish finder. An excellent feature as sometimes I like to fish from the shore but would still enjoy the help of a Fish finder. Wow, I couldn’t believe I almost missed this HawkEye F33P Portable Fish Finder by NorCross. This NorCross is one of the best all portables. I have ever seen at a price you WILL NOT believe. Ideal for fishing expeditions and family vacations, the Norcross HawkEye F33P offers the latest in portable fish finder technology and is guaranteed to help you come up with better fish stories than ever before. Norcross Hawkeye f33p fish finder Using an ultra wide, 45-degree sonar beam angle, this system delivers accurate depth, fish and bottom structure readings from 1.5 to 99.9 feet. Operational down to zero degrees Fahrenheit, this unit includes a trollable, mountable, and floatable sonar sensor with 35 feet of cable and cable tie-strap. Amazing! The HawkEye is very, very, easy to use; simply turn the power on, throw the sonar sensor from the shoreline, bridge, or boat, and in no time flat, you’ll receive instant depth, fish, weed, and contour readings. With its “SideScan” adapter, the HawkEye F33P can also attach to a broomstick handle to scan under weeds, lily pads, ice, or docks. For added convenience, this system comes with mounting tabs for hull mounting of your portable fish finder to canoes, kayaks, and on boats. 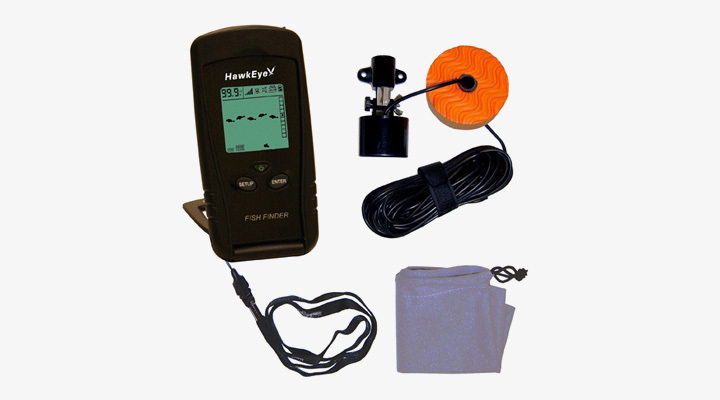 The Norcross Hawkeye f33p fishfinder delivers reliable readings by using algorithmic programming. This reduces the number of false readings, while the unit’s fish identifier, depth scale, and two-stage audible fish alarm ensure that you’ll always know exactly what kind of fish you’re closing in on. Designed to hold up under all kinds of conditions, the antenna is powered by four “AAA” batteries for 20 hours of continuous use, the backlit display prevents eye strain, and a special LCD protector eliminates condensation in the display. A great feature all by itself. This portable fishfinder features a palm-sized design that fits into easily into your tackle box, gear bag, or pocket, making this an extremely versatile unit you’ll rely on over and over again. A great feature for preserving battery power is the fish finder has an automatic “power-off” feature to prevent battery drain if you accidentally leave the unit on. An audible alarm sounds when a group of fish is detected. It will NOT sound if just one fish is detected. Leave the alarm on if you are using a crankbait so that you do not have to steadily watch for fish on the screen. Portable, simply turn the power on, toss the sonar sensor from the shoreline, bridge, or boat, and in no time flat, you’ll receive instant depth, fish, weed, and contour readings. Loving this feature. The Hawkeye fish finder has an automatic “power-off” feature to prevent battery drain if you accidentally leave the unit on. Now this is a feature I really need as I always forget to turn things off. When the depth display reads “—” continuously for 5 minutes, the display will shut off automatically. The depth finder is very accurate, but not as accurate as an average fish finder mounted permanently to a boat. Really easy on the batteries. The cord is also way too long for how some fisherman uses it but is nice if you fish from shore and throw it out to where you’re casting to. 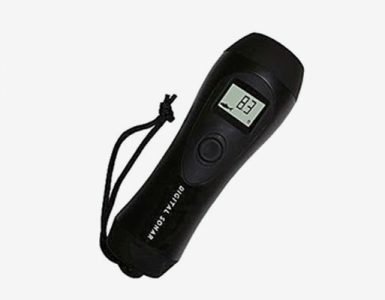 Love the fact you don’t need a boat to use this truly portable fish finder, a great selling point for many anglers.